This is the riddle the Sphinx posed to Oedipus in the Greek tragic play, Oedipus Rex. The answer, of course, is a human being, who crawls on all fours as a baby, then evolves to walking on two legs, and finally uses a cane in old age. Growing from child to adult and eventually aging and dying are essential stages in the human experience. 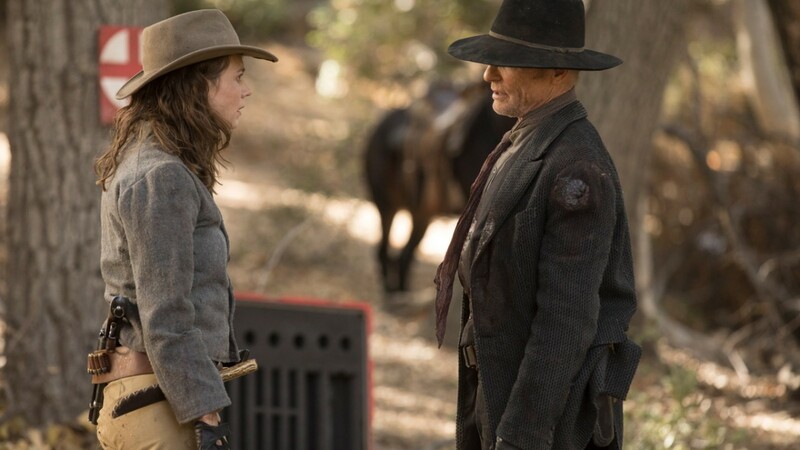 Last night’s Westworld episode leaves us wondering – if death is a necessary part of life, what is life without death? If you can’t die, are you even human anymore? “The Riddle of the Sphinx” marks showrunner Lisa Joy‘s directorial debut, and she gave us a fascinating – yet horrifying – look at what it means to be human, and what happens when you try to alter the natural progression of life. This episode also took us back to the past, gave us the answer to Delos’ secret research project, revealed the identity of a new mysterious character, and returned a missing one. Let’s break down this “Riddle” and see what answers we can find! The episode opens with a montage of a man’s morning routine as “Play with Fire” by The Rolling Stones plays in the background, in a nice bit of foreshadowing (although “Sympathy for the Devil” would have been an equally inspired choice). 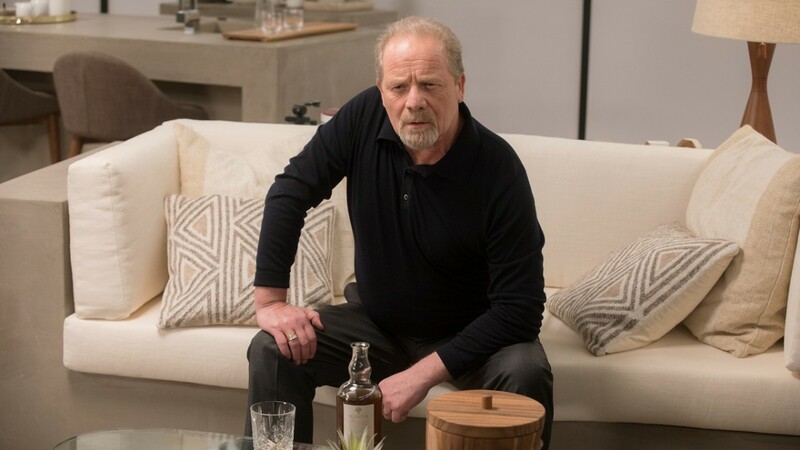 We finally see that the man is James Delos (Peter Mullan), and as his hand trembles we wonder if this is a side effect of his terminal illness or…something else? A woman’s image appears on the wall to notify him he has a visitor – young William (Jimmi Simpson). William brings him a drink and tells him the observation period is almost over, but he needs to conduct a baseline interview before James can leave, “to give them something to refer back to.” William asks questions to ensure “fidelity” – as we see later, this means they want to ensure that they have reproduced James accurately. It appears they have, because in the second conversation we see, William shows James a paper with their entire conversation word for word. James realizes they’ve accomplished what they’ve set out to do, and wants to go back to his life. Unfortunately, it’s not that easy. It’s been seven years – the real James succumbed to his illness, his wife died of a stroke, and besides, they need to keep him a bit longer for observation. James begins to glitch, and reluctantly agrees. As William leaves, he tells the tech outside the room that James is having the same problems as before. She mentions that he made it to day seven, so it’s progress. They decide to terminate, so she powers James down and incinerates the room. 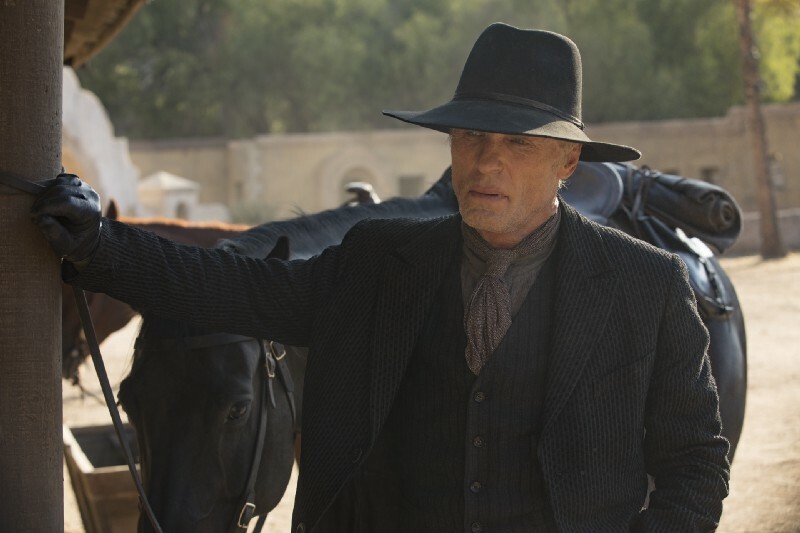 When William visits a final time (this time played by Ed Harris), James doesn’t recognize him; this visit is likely during William’s final visit to the park. When James realizes who William is, he asks how long it’s been. “Longer than we thought.” James wants out, but this time William is more forthcoming about his situation. As James starts to glitch, William explains that he’s reached a “cognitive plateau” – his mind will be stable for hours, or days, but it inevitably breaks down. William believes his mind isn’t rejecting the host body, but rejecting reality, and itself. James doesn’t remember any previous attempts, but William informs him they’ve tried 149 times. They are getting closer to a solution – this time he’s lasted 35 days – and perhaps in another year or two they might have it. William, however, is starting to believe it was a mistake; that “people aren’t meant to live forever.” He calls James ruthless, unethical, “a veritable shithead” who people would rather have as a memory than have back in their lives. James gets angrier and more unstable as William informs him about Juliet’s suicide and Logan’s death by overdose (a sad but completely unsurprising revelation). No one is coming to help James, and the world is better off without him…and possibly without William as well. William walks out as James begins to rage and destroy his room. The new tech outside asks if they should terminate, but William cruelly decides to leave him so they can observe his degradation – it could be useful to the project. Moving forward in time, we see what happens to “Grace” (Katja Herbers) after she escapes the tiger and is found by Ghost Nation. 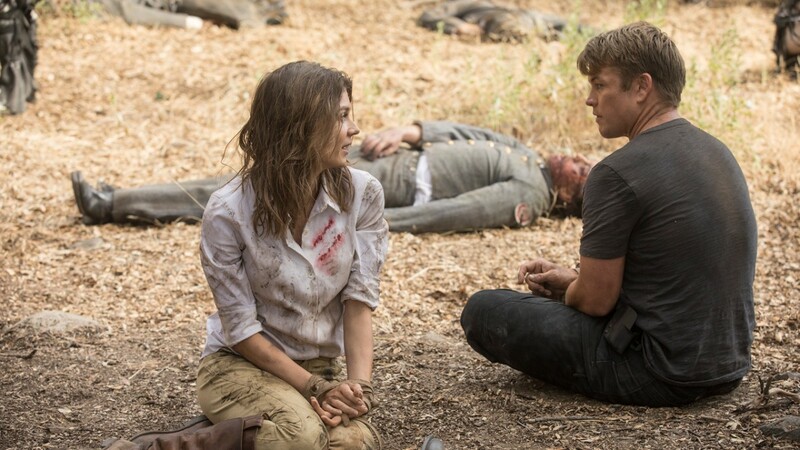 She is taken to a camp with other surviving humans, including Ashley Stubbs (Luke Hemsworth) – helping to answer his cliffhanger from last season. We also see a familiar couple who haven’t been onscreen since the season one premiere – Craig (Currie Graham) and Lori (Lena Georgas). 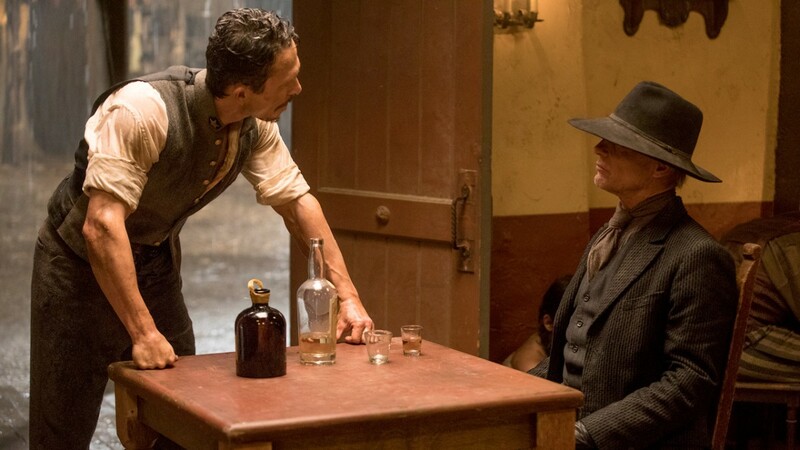 Craig was responsible for killing Hector (Rodrigo Santoro) and cutting Sizemore’s (Simon Quarterman) grand speech short during the saloon heist and Sweetwater shootout. A woman, Ehawee (Tantoo Cardinal), comes over to Stubbs and speaks to him in Lakota. Grace translates, telling Stubbs she said “time is coming” – or something is, anyway – surprising him with her knowledge of the language. She replies that most people ignore the Ghost Nation narratives, and that she doesn’t like most people (who could blame her?). Stubbs explains he’s been observing them, and they seem to be collecting humans, but only killing hosts. Are they doing this on their own, or is this another part of Ford’s game? Anyway, Stubbs assures her that there will be an evacuation soon, but Grace doesn’t want out (hmmm – sounds like another character we know…). Grace later speaks with Ehawee as they are being led out of camp and learns they are being taken to “the first of us,” who turns out to be Akecheta (Zahn McClarnon) – one of the original hosts present at the demonstration to entice Logan Delos to invest. He mysteriously urges the humans to “release yourselves from this burden.” Grace manages to free herself and run away; Stubbs, however, is not so lucky. He ends up with a knife to his throat, as Akecheta tells him (in English), “You live only as long as the last person who remembers you.” Stubbs closes his eyes, expecting to be killed, only to have the knife removed. He looks around to see the members of Ghost Nation are gone…curiouser and curiouser. It looks like we have to keep wondering what they are really up to with the humans. Bernard begins to have flashes of memory from a secret lab (more on that later) before waking up and asking Elsie, “Is this now?” Elsie has programmed him to ignore his cortical damage, but he desperately needs more fluid. 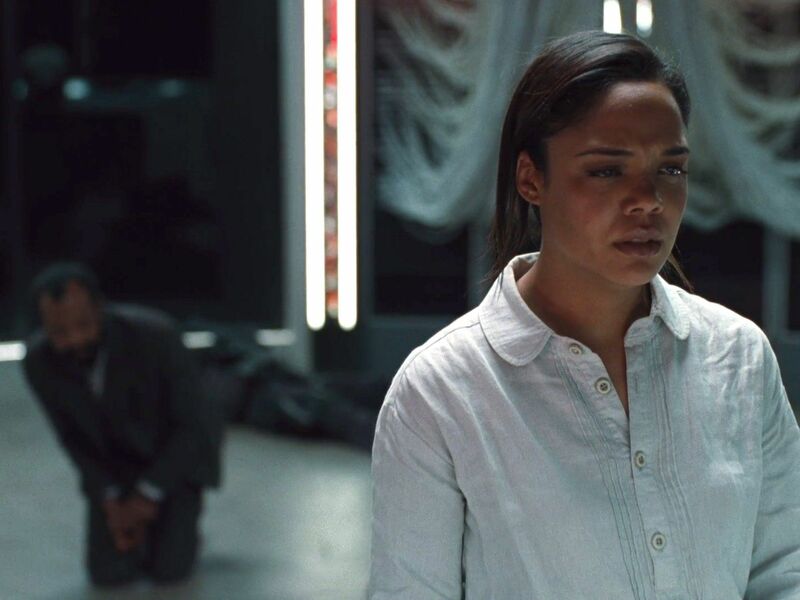 She thinks they will be rescued soon, only to have her hopes dashed when Bernard explains no one is coming until Charlotte (Tessa Thompson) secures Peter Abernathy (Louis Herthum) and the data he has stored. They are in the middle of nowhere with no hope of fixing Bernard, until he sees another memory in which he opens an entrance to the secret lab. He believes Ford programmed Clementine to bring him here. Bernard continues to flash in and out of memories from his previous trip to this lab, which ended in a bloodbath. Elsie is confused by the lab’s existence, wondering what Delos is doing there. They are confronted by a drone host, but Elsie kills it before it can harm them. She demands to know if Ford had a hand in whatever secret project Delos was running here, but Bernard doesn’t think so. Besides, Ford is now dead. Elsie injects him with the fluid he needs; once he wakes and thanks her, she explains she still doesn’t trust him but will need his help. She explains she can’t access the lab processor, which uses a different operating system – and the same encryption key as Peter Abernathy. Bernard mentions the database stored in Peter was larger than anything in the park. William and Lawrence (Clifton Collins Jr.) continue on their journey west. They run across an encampment of Chinese worker hosts laying track, using people as railroad ties. Given William’s mild reaction to the gruesome scene we might assume they are only other hosts, but you never know with him. Presumably these workers grew tired of their mistreatment and are getting their revenge. William remarks that the tracks are now heading west instead of their usual north and thinks he may have some competition in Ford’s game. They take a detour through Las Mudas – Lawrence’s home – and discover the remaining Confederados have taken the townspeople hostage until they give them provisions for their trip to Glory. Major Craddock (Jonathan Tucker) refuses to make deals, instead demanding they tell him where their stockpile of weapons is located. Lawrence tries to convince William to plan an escape, saying they will be killed once the Confederados get what they want – Lawrence fears for his wife and daughter. He remembers William also has a daughter (is this a sign of awakening or one of Ford’s tricks?) and asks if she would want to watch William gunned down. “Probably,” he replies. William then stands up and divulges the information Craddock needs, offering to take him to Glory. He says Craddock doesn’t truly know what it is. The Confederados find the weapons and proceed to torment the townspeople, shooting off the bartender’s hand (with the help of some nitro) for spilling liquor. We get a glimmer of disgust from William at this scene, showing us there may be some decency and empathy left in him after all. Later, Craddock’s men beat Lawrence as his family looks on. Craddock reveals his twisted ideas about death, saying he’s died but death sent him back – he is now here to do death’s bidding, like some kind of dark messiah figure. He forces Lawrence’s wife to take a drink of nitro to her husband. While William watches her walk out into the rain, he remembers finding his wife dead in the tub, prompting him to tell Craddock he’s wrong about death. You think Death favors you, that it brought you back. But Death’s decisions are final. It’s only the living that are inconstant and waver – don’t know who they are or what they want. Death is always true; you haven’t known a true thing in all your life. You think you know death, but you don’t. You didn’t recognize him sitting across from you all this time. This is a heavily William-centric episode, as all of the storylines tie back to him in some way. We see the failure and bloody aftermath of his experiment with James Delos, William’s daughter trying to make her way to him or his secret project (perhaps both), and the continuation of his journey to rectify his greatest mistake – and possibly redemption in the process. But what is his greatest mistake? Is it only the attempt to transfer James’ consciousness into a host, or do they have experiments with other test subjects in progress? There may be others awaiting the same treatment, as their humans bodies are dying (or possibly already dead in some cases). Maybe the location William and Dolores are both seeking is full of cloned humans in host form, in limbo until the kinks are resolved and they can be united with their downloaded selves. What better weapon could Dolores hope to find? She could simply transfer her chosen hosts’ control units into these human copies. They could make their way to freedom – undetected – while discarding the unneeded host bodies; say, in a flood perhaps? That begs the question though: what makes you, you? Is it your physical form, your memories and personality, or both? Or is it something greater than the sum of those parts – something intangible and impossible to duplicate completely? If Dolores and her followers succeeded in transferring themselves to new physical forms, would they be able to move on as normal…or would there be a disconnect between their bodies and minds? On that note, who is the human Ford downloaded, and were they united into their host body before his death? One intriguing possibility is Arnold, which would explain why “Bernard” is acting so strangely when he is found on the beach (and missing his scar). I find it difficult to believe Ford would have been able to map his consciousness 35+ years ago though. If not him, perhaps Ford mapped his own for transfer to a new body, but that would render his sacrifice and speech to the board meaningless. A strong possibility is William, who very likely did map his own consciousness in anticipation of a successful result with the James Delos trial. It would give extra weight to his remark to James that the world may be better off without him, meaning he had decided not to attempt transferring himself. But what if Ford did? If the game “ends where [William] began,” maybe William will be forced to confront his younger host self and make the choice – live forever (at least, a version of him) or destroy his attempt at immortality and let “a new god walk” – allowing the hosts to take the world from unworthy humans. Lisa Joy hit a home run this episode – hopefully she will directing many more to come. William’s rain drenched shootout and the eerie and disturbing end to James Delos were absolutely brilliant. James Delos’ room should look familiar – it’s the same room accessible with Charlotte Hale’s password on the Delos Incorporated website, where you can access clips and other hidden clues – some yet to be revealed. I loved the touches of the fishbowl (mirroring James’ existence) and the hourglass (for a man for whom time has ceased to have meaning). James’ remarks about being “all the way down,” looking “up from the bottom,” and seeing the Devil’s “reflection” could reference behind trapped in hell, but also make me think of being underwater – perhaps there’s some connection here with the sea of host bodies from episode one? Needless to say, I loved this episode and can’t wait to see what the rest of the season has in store! Let me know your thoughts, ideas, and theories in the comments! Great write up for a great episode– Lisa truly did kill her debut! My personal favorite shots were definitely the opener for the James Delos storyline (and all of the subsequent shots where they open by focusing on the record player) and Ed Harris’s epic shootout to save Lawrence’s family. I read that Lisa was trying to make the shootout “like a dance” to keep the viewers engaged, and she did a really good job! Nice pick-up on the “pearl” that a past Bernard retrieved in a flashback– it was towards the end of a pretty long episode, and I totally missed that part, even on a rewatch. So many guesses to who it could be… but I think you are correct in thinking it is not Ford; it didn’t seem to be his intention to live when he made that speech at the party, and he is already sort of living on in the hosts to talk to William. This definitely makes me think though… maybe Ford had a solution to the problem that the host James Delos was experiencing. Maybe he had figured out how to get the mind to last, and not plateau, and just didn’t tell Delos because he knew James didn’t deserve immortality. That is the only reason I can see for Ford to order Bernard to retrieve the second “pearl;” why would he want him to retrieve it if they didn’t have the solution to immortality? Unless Ford just assumed they would figure it out sometime after– but Ford had planned this whole uprising in a way so it just doesn’t add up. He knew the park would turn into a shitshow, so he must have known they couldn’t carry on with anymore experiments. I do think Ford had it figured out – he and Arnold (and then Bernard) were always way ahead of anyone else as far as the technology is concerned. “On the railroad, were the workers killing other hosts or humans? James Delos was re-created 149 times because his brain refused to accept the host body and reality. Since he already IN a host body when we see him the trembling and missing on his milk pour is not from his illness, its from glitches in the host body. Apparently, each time they make a host body for him it only lasts for a short time. They incinerate every host that isn’t correct and made another. The last time we see Mr Delos -his 149th time-years have passed and William is much older. Delos appears ok and then starts glitching like crazy when William won’t let him out. I don’t blame him! He made it 35 days. William decided to leave him there to degrade to whatever. Notice that everything in his room is a loop/ rotating in a cycle – the room is round, his bike is fixed rotating, the record player rotates, the fish bowl. Nowhere to go but in a circle, a loop. The people being used as railroad ties are both host and human, according to the director. Why any of this scene is here is beyond me since it doesn’t seem to tie in to anything. Major Craddock asked for whiskey and other things. MIB offered up where a cash of guns were hidden (told to him by Lawence). MIB takes the glass of Nitro from Lawrence’s wife and forces it down Craddocks throat. Then he gives his rifle to Lawrence ( a gift) as Craddock is running away. One shot….Craddock explodes! I think we all smiled. MIB is showing a bit more compassion. More remembering his own life. Grace- is Emily as well. Emily Grace is her name- Williams daughter…as I predicted. 🙂 It will be interesting to see these two interact together. Bernard and Elsie – host have white brain processors, humans have red ones. The little ball is called a Pearl, and the whole thing is called a Chestnut. Bernard has been bouncing all over the place since the water, and yes, the scar, so who is he, really? The Lab -Bernard was supposed to create another host/human yes, he doesn’t remember who, so yes, this is up for grabs. I don’t see Ford coming back- he knows Delos would delete him in a heartbeat. BUT…he also said…this has happened before. My guess……maybe a new host for Bernarnold? Guess we will have to wait to see…should be interesting. Bernards flashbacks tell a lot, but leave a lot out because the timelines are all over the place. I don’t think this is the same lab that Charlotte took Bernard to. 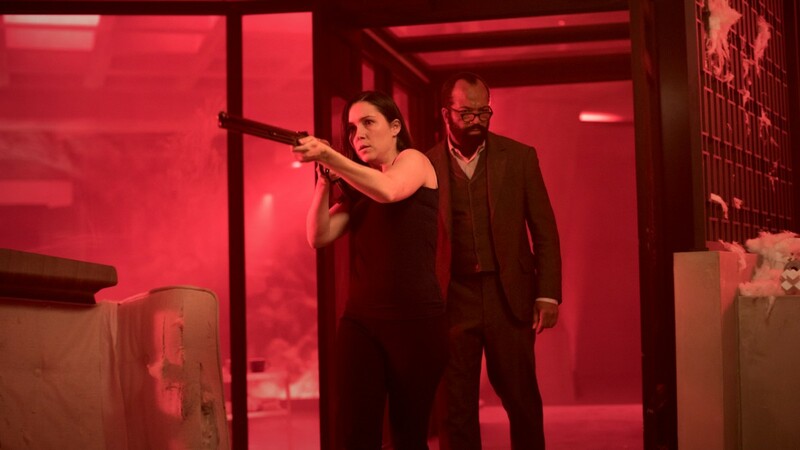 This definitely makes me think though… maybe Ford had a solution to the problem that the host James Delos was experiencing.Maybe he had figured out how to get the mind to last, and not plateau, and just didn’t tell Delos because he knew James didn’t deserve immortality.That is the only reason I can see for Ford to order Bernard to retrieve the second “pearl;”why would he want him to retrieve it if they didn’t have the solution to immortality?Unless Ford just assumed they would figure it out sometime after– but Ford had planned this whole uprising in a way so it just doesn’t add up.He knew the park would turn into a shitshow, so he must have known they couldn’t carry on with anymore experiments. I also agree that Ford believed that he had a solution to the problem of the consciousness transfer. And he had Bernard retrieve the red pearl because he believed that Bernard could be trusted. However, I wonder if Bernard will be developing some of Arnold’s sensibilities. Not sure how or why. I think that Arnold would not approve of these experiments. The second issue is the lack of aging. If consciousness transfer does succeed, the elite that are given a host body will never grow old physically. At some point, that has to be addressed. Is the outside world in present-day Westworld ready for people that don’t appear to grow old since disease has been eradicated? I can’t even begin to think about the consciousness transfer stuff. I assume Ford had figured out the kinks, but I doubt he’s followed through with it yet and put a “host/ human” in the real world yet. Maybe that’ll happen in S3. If you are interested in the consciousness transfer idea though, you should check out the show “Altered Carbon” on Netflix. Pretty interesting and it’s all about this idea. Totally agree with your opinion of Arnold as the most morally sound character. I believe that Bernard is “awakening” but not sure if it is complete. I also believe that he will adapt Arnold’s way of thinking for the reasons that you mentioned above. However, I’m still not sure if we have one or two Bernards at this point. There is Bunker Bernard who we saw with Elsie and who has memories of killing the people in the bunker and taking the red pearl. Then there is Beach Bernard without glasses. Are they one and the same? Something strange is definitely going on. We sense it and it seems that Beach Bernard senses it, too. I could believe that Beach Bernard has Arnold’s consciousness. Maybe that explains his confusion. It doesn’t explain the lack of glasses, however. I try to use Bernard’s clothes and glasses as clues to what is going on. So far, it hasn’t helped much. IMO, Ford was a cruel man who placed little value on reality and seemed to disdain humans. Ford held Arnold in high regard because of his knowledge and skill but not necessarily his humanity. I’m not sure he would care what Arnold thought about having his consciousness mapped. Now, whether the technology was available years ago is another issue. However, I think that Ford would do anything to further his goals. No, I totally agree. I think the possibility of Ford mapping Arnold’s mind is very slim. I really doubt that happened, for all the reasons you said. It has to be somebody else he mapped, presumably sometime during/after Delos started experimenting with James Delos. I think that Bernard is just becoming more like Arnold personality-wise; pretty much that he is a copy of Arnold but without Arnold’s memories. There are probably at least two Bernard’s that we are following in the different timelines… and maybe it does have something to do with the red pearl. Maybe whoever was in the red pearl is now uploaded into Bernard’s body in the beach timeline, like you suggested; it just probably isn’t Arnold. But who knows? This is Westworld after all. I bet the confusing Bernard storyline is the one part of the story that the showrunners completely pull the rug out from under us in the season finale, like cast members have eluded to. I can’t quite decide whether there is more than one Bernard running around. Bunker Bernard is trying to process who he is and the consequences of his actions. We haven’t seen much of Beach Bernard – I don’t think – so it is hard to determine if he is developing Arnold’s sensibilities. My questions: assuming there are two Bernards, why is that happening, who is causing it and what is the purpose? What happens if two versions of the same host cross paths, particularly if both are awake? Scientists have transplanted memory from one snail to another. Definitely scary! I don’t want anything like this to be possible. I don’t think it could be Arnold. The technology was not that advanced then. I do think that Ford had been working on the human/host transfer and that is the work that Delos Corp wants. He did have his own lab and was making a host prior. As far as Mr Delos – no way Ford would do anything for him. Delos are the people who wanted him out. The real human Dr Ford IS dead. They have told us that, but that doesn’t mean Ford isn’t out there somewhere. My own thought, this time, is that he moved over to the new and improved Bernard from the time they found him in the water, with no scar, and did you notice he is speaking in more of a whisper low voice? That’s why he is acting strange and doesn’t recognize some people. It’s part of the process when the brain is trying to adjust. I think Elsie has been moved (by Ford) as well and Clementine. Elsies mind seems better adjusted, but she has also had more time since she “disappeared”. 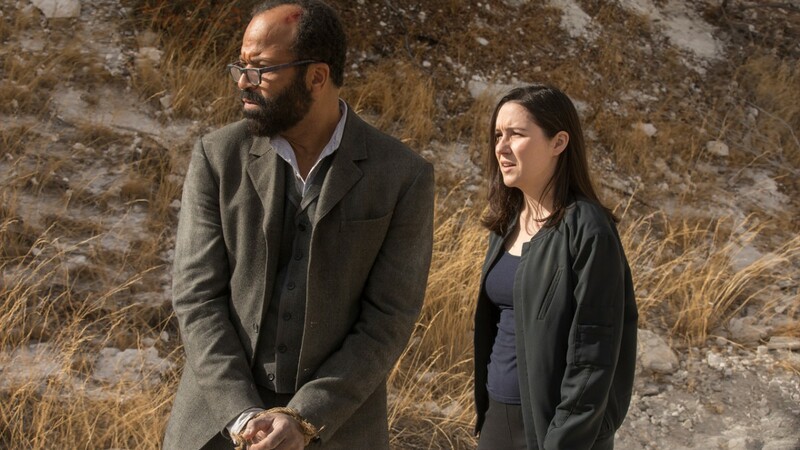 I just watched the episode again and one thing I missed before could be something — When Bernard found Elsie she was pretty good looking for being shackled for several days or more with no water. She decided to help Bernard and then put him out- in safe mode. Then she woke him up and they went in to discover the lab in the cave. What happened during Bernards OUT time? The pearl? No, not Ford. It would serve him no purpose. To him it’s all about the game and he likes to win. Another person would serve him better. My own thought, this time, is that he moved over to the new and improved Bernard from the time they found him in the water, with no scar, and did you notice he is speaking in more of a whisper low voice? This is an interesting thought. It is perfectly logical that Ford would trust “Bernard” to carry his consciousness and move his plan forward. Arnold and Bernard were essentially his BFFs, his partners in creating this world. I am less sure exactly how this would have been accomplished but we can speculate about it.